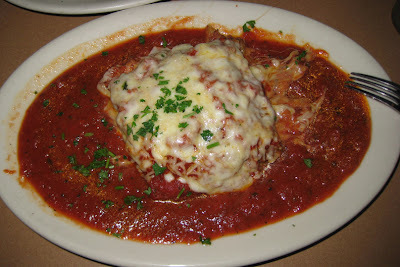 When my brother lived in Cockeysville, he would frequent Fazzini's on a regular basis. He raved about their meatball pizza, topped with sliced meatballs that would frizzle on the edges in the heat of the oven. Of course, by the time Mr Minx and I got around to paying Fazzini's a visit, it had closed. Eventually, however, it reopened, and we had another chance. After being seated in the dining room of the tiny strip mall restaurant, our enthusiastic waitress brought us a basket of soft Italian bread and a saucer filled with olive oil and cloves of roasted garlic. Hello - roasted garlic olive oil is so much tastier than the usual EVOO with a drizzle of balsamic, herbs, and/or red pepper flakes! Especially when one takes some of those oozy soft cloves and schmears them on a piece of bread. The bread wasn't bad, but if it were better (crustier), I would have been quite content making a meal out of oil and bread. That would make for a really boring blog post, wouldn't it? Instead, we ordered actual food. While pizza and pasta are always tempting, we decided to try neither this first time. Mr Minx started off with a half salad, but I went for the gusto and ordered the fried calamari. Many, many, many little squids gave their lives for this dish. The menu should warn that this is a large entrée-sized portion, or an appetizer for four. 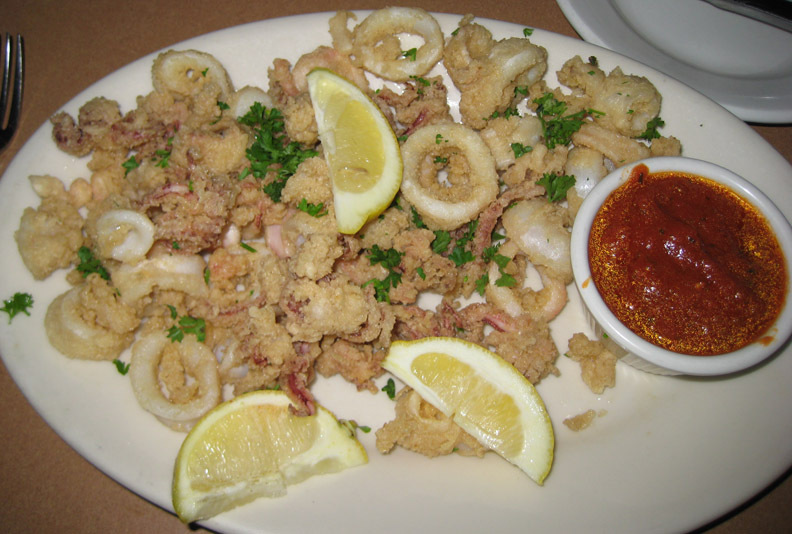 The portion was huge, and the calamari were tender for the most part, but they were bland. The menu claims they are coated in seasoned flour, but I sure had to use a lot of salt and pepper to bring out some flavor. Not the best fried calamari I've ever had, but decent enough. For my entrée (the two bites of it I was actually able to eat after all that fried squid), I ordered the stacked eggplant parmigiana. The parm itself was about 5" square and nearly 2" high, but it was nearly consumed by a flood of marinara sauce. While the sauce tasted fine, it completely overpowered the delicate flavor of the eggplant. Mr Minx ordered the Chicken Francaise "Michael," two panko-coated chicken cutlets with asparagus, prosciutto, capers, and a lemon butter sauce. The butter sauce was the best part of this dish, redolent of citrus and wine. And while there was a lot of it, it didn't overpower the dish's other strong flavors. 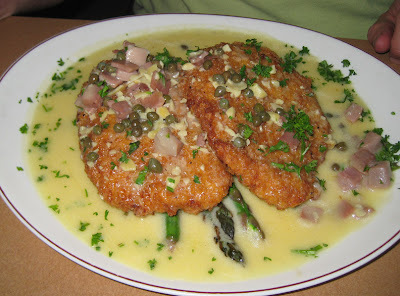 There was zero subtlety in this dish, but we enjoyed it. With both entrées came bowls of linguini marinara. Fazzini's touts their homemade pasta; a real shame the linguini was cooked to an unpleasant mush. Based on the strength of the garlic olive oil and the chicken dish, I'd say Fazzini's definitely deserves another try, next time for pizza, a sub, or maybe the chicken marsala.